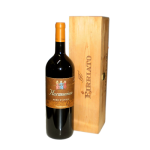 Harmonium is a wine that carries with it profound meanings. Harmony but also music, given that the harmonium is a musical instrument keyboard. Excellent example of Nero d'Avola, which enhances the intrinsic quality of each grape variety and Sicily itself. Harmony of taste to enjoy with a saddle of venison with wild plums.